It’s Phoenix, AZ sometime in the future. There’s no water – because of climate change the drought is never-ending. Las Vegas and California are the two big cheeses when it comes to groundwater and (especially) the Colorado River. There are three interacting story lines. First, Angel is the titular water knife, a guy from Las Vegas who will do anything to make sure his city gets water. Including going to Phoenix to see who has what water around there. Second, Lucy, a reporter bound and determined to get the real story – not just the click-bait-y stories – about the politics around water rights and who gets what. And third, Maria, a teenager from Texas – which has even less water than Arizona – who’s just trying to stay alive. 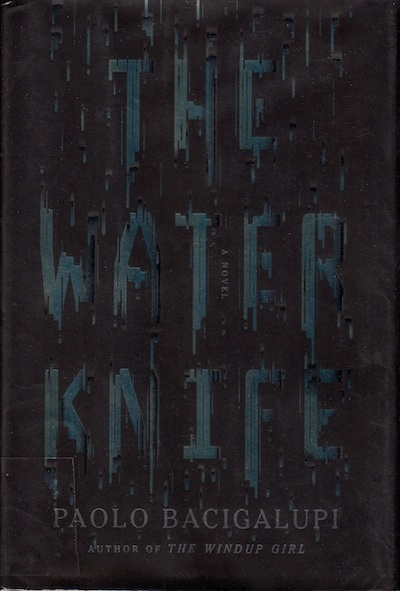 The Water Knife is noir-y and grittier than I usually read and recommend. But this is good. I like the noir bits: the world isn’t always a clean place and people are often greedy. Especially in a place where there’s not enough to go around. Look, I live in California and we are on our fourth year of drought. There’s some evidence that there will be a rainy winter this year, but there’s also a prediction that that rain is going to go north of us. We may not see it. The Water Knife is an interesting take on what a waterless West might end up looking like, particularly if there’s a weak national government. It’s worth reading.